It’s no secret that schools benefit from the power of teamwork. However, a recent visit by ET Team members and a team from Boxlight to Hoisington, Kansas school district USD #431, is proof that there’s power in a team approach to educational technology. Hoisington USD #431, recently built a new building and, after a year of testing, deployed Boxlight P12 Touch projectors in every room. Unfortunately, during the testing time, new units were released with a few quirks in them that conflicted with the glossy-finish whiteboards. Over the past few months, there have been numerous on-site tech visits, videos, and troubleshooting calls. To get these customers taken care of, Boxlight deployed an entire team of software engineers to visit Hoisington. These engineers traveled all the way from not only Boston and Seattle, but as far away as Taiwan. The prize for the farthest distance traveled goes to both Michael and Lavakav, who traveled over 24 hours (all the way from Taiwan), to come support Kansas schools with their technology troubles. Lavakav, Arun and Tim got right to work! The Boxlight team really took the time to talk and work with each teacher to best understand the troubles they were experiencing. In less than 48 hours, the issues were identified and addressed. The software was adjusted and a believed resolution was deployed that got every room up and running. To be a part of the amazing thought process behind the development of the software was very eye-opening. It gave us much more of an understanding about all the work that must go into a software product and its functioning, and how seemingly small differences in a classroom setup can cause issues. It was also nice to finally meet face-to-face the people that we often correspond with via email or phone when we are troubleshooting technology issues. 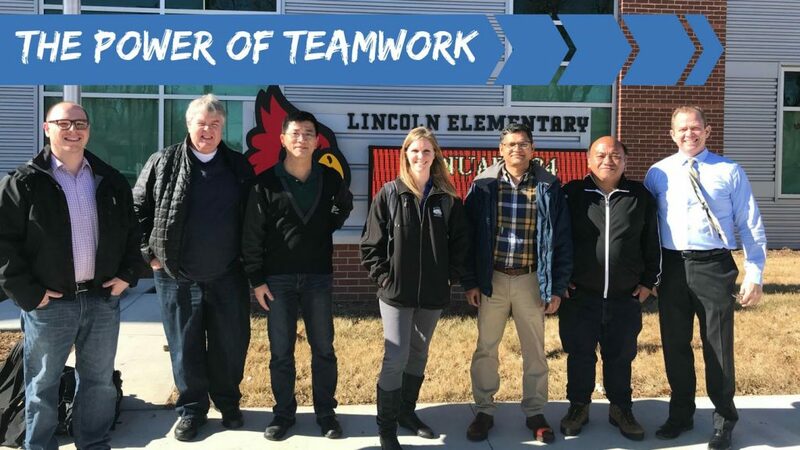 Our ET team tries our very best to support our schools, but this is positive proof that there is power in teamwork – especially in a larger team from all over the world!